As an aspiring cartoonist, for me the most uninteresting task in the process of making a cartoon is lettering. Whether done on paper or in Photoshop, lettering often involves trial and error. The text may not fit the frame or the speech bubble, or the words may need to be corrected; whatever the case, it is a laborious task. To spend more time drawing witty cartoons instead of worrying about lettering, I got Comic Life Deluxe. 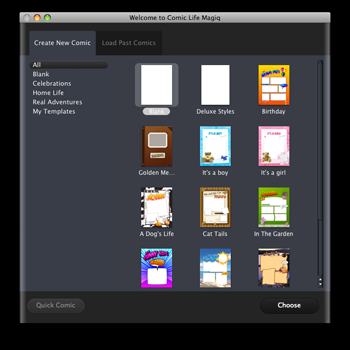 With many preset frames, text styles, and action words, Deluxe served my needs, but now there is also Comic Life Magiq. Is Magiq better? What is so magical about it? The most obvious difference with Magiq is the interface. Instead of a clean page to drop frames, texts, photos, etc., you now have a handful of templates to choose from. With the new interface, Magiq looks like a program to make greeting cards. Initially, I thought it was a bad move to go away from making comic strips, but after a little time exploring the templates, my mind was changed. The templates are easy to use and very nicely designed. Any set of pages can be saved as a template, too. I happened to go camping a few weeks earlier and was able to make use of the camping template. Using the templates is a good way to become familiar with the new features Magiq offers, but I also dove in with a blank template. On Magiq’s initial screen, you either choose a template or load a past comic. Templates get you up and running quickly. After the templates screen, there are even more changes compared to Deluxe. On the right, you still have the frames and your photo collection, but the left side of the screen is eaten up by the Details panel. Running along the bottom, somewhat like the old Comic Life, you have the various types of speech balloons and lettering styles. However, here you also have some of the new Magiq features, like clip arts and the spray can. Clip arts are vector graphics that can be adjusted to your heart’s content, although I have not been able to use them outside the templates. The spray can is more like the brush in Photoshop, where you can add shapes like hearts or flowers atop your image. The panels are fully adjustable and can be totally hidden away, although I prefer to have the old setup, with just one panel on the right. Most of the time, you probably can work with all of the panels hidden. Every page element, when selected, shows control gadgets on their borders. You can adjust the item’s angle, location, and shape. A new way to select style, whether for a speech bubble or a frame, is the wheel, which corresponds to the control gadget at the upper left of the item. As a different slice of the wheel is selected, you get a preview of the style. Unlike Deluxe, no names are associated with the styles. While it is true that sometimes the names in Deluxe seem meaningless, most of the time they are descriptive enough, so I do miss them. By default, you have just a center area to work with, but all the panels can be hidden away if needed. Control gadgets all around each page element. Make your style selection with the wheel. There are some much more welcome changes. One is the speed at which Finder pictures are listed. On my 1.67 GHz PowerBook G4, there is a long delay when I switch Deluxe’s image source from iPhoto library to Finder. On my wife’s 2.16 GHz MacBook—a faster Mac, granted—there is no delay whatsoever with Magiq. Another difference that I like is the ability to have more than one picture inside a frame. Drop a picture on top of one already in a frame, and you have the option to add the picture or replace the first. The most appreciated new feature is probably the Magiq image editor. With Deluxe, once you drop a photo into a frame, there is not much else you can do to it, other than applying filters to the entire photo. In Magiq, you can do so much more, all without ever leaving Magiq. In the sample image, I applied a sepia tone to the image to give the impression that the event happened in the past. I also drew by hand a series of lines emanating from the center of the photo, to highlight the center. No more switching to Photoshop and re-importing photos. To somewhat illustrate the new features found in Magiq, I created a comic strip based on the song “A Laptop Like You” by folk singer Jonathan Coulton. Coulton’s songs are Creative Commons licensed, and everyone is welcome to use them as long as some conditions are met. Coulton fans have created music videos out of his songs but the “A Laptop Like You” video happened to be no longer available on YouTube. I am not much into video, so the comic strip is the platform for me. The first few verses of Jonathan Coulton’s “A Laptop Like You” in comic strip form. For now, I made just enough frames for one page of the strip but still made enough use of some Magiq features. The first frame is really a borderless frame containing a circular cutout of the photo within. In the fifth frame, where I found love with the Aluminum PowerBook, the frame itself takes on the heart shape. Finally, in frame seven, the “love” emanating from underneath the aluminum case is a result of the spray can. Comic Life Magiq is a big improvement over Comic Life Deluxe. Deluxe was already easy to use, and Magiq keeps the ease while adding more power. Not all the changes are good, like the apparently cluttered interface, but overall the changes are for the better. 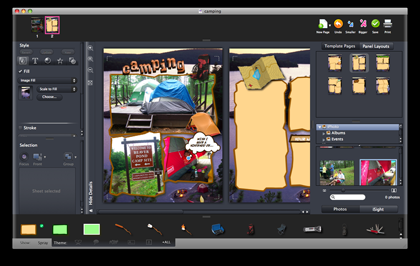 With features like templates, clip art, the spray can, and the image editor, Comic Life Magiq is a Very Nice application to have. If you already use Deluxe and need one more reason to upgrade to Leopard, Comic Life Magiq can be that last excuse. Do I have to uninstall ComicLife to install ComicLife Magiq? I have ComicLife1.3.1 already installed. I tried to install ComicLife Magiq as well but it will not open the app. I did not have to uninstall ComicLife to install Magiq. One gripe, Magiq will not open my past comics done in Deluxe. The developers need to fix that.